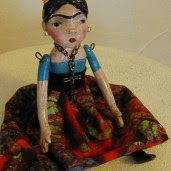 Come over to nancye's art dolls and make this Wild Woman Wand FREE. It's a Free Playshop to get your hands dirty in. Come on join us. Nancye she is beautiful! I can't wait to finish mine and get it posted in the forum! I'm having so much fun as a member on your site! I can't wait to take your classes! Happy to get to know You through the OWOH!